I bought myself Rumer Godden's In This House of Brede for Christmas. I had thought Rumer Godden was a recent discovery, but now I realise I had read this book at school, and I think probably Black Narcissus as well, without remembering that they were written by Godden. 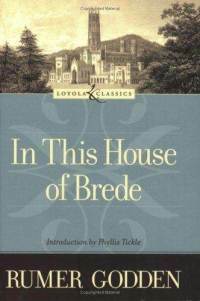 In This House of Brede is the kind of book you wish you could live inside forever. It's so rich, so wise and so fascinating - and it's about nuns! On one level, it's the story of Philippa Talbot, a successful 40-something civil servant, who turns her back on her old life to enter the abbey; and it's the story of several years in the life of the community, the incidents and accidents, the disasters and blessings that visit them. 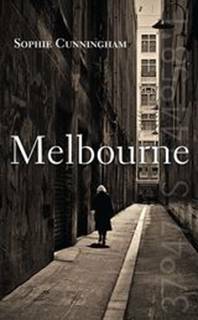 But In This House of Brede is also an unflinching examination of community life. The ninety-six women of the abbey are all very different personalities, with different backgrounds, and they are far from perfect. They remain people - striving for holiness, working hard to help each other, but flawed, rubbing each other up the wrong way, irritating, sometimes clashing outright. Rumer Godden captures the pinpricks and rewards of life in a community where there is no escape from your companions. Dame Beatrice is sentimental, Dame Agnes sharp-tongued. Abbess Catherine is strong, but weighed down with the burdens of her office as leader. Sister Hilary is slapdash, Sister Cecily perhaps too joyous, too sure of her vocation? Dame Veronica is weak, Dame Maura rather frightening. 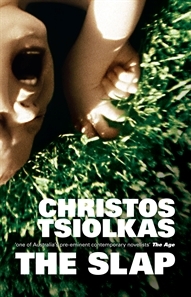 The characters are vividly drawn, their struggles very real. And perhaps most importantly, the book draws us into the spiritual life of the abbey - the whole purpose of the nuns' lives. They are an enclosed order, separated from the world for their work of prayer, study and song. To a non-religious person, there is something slightly surreal about the notion of all these women dedicating themselves to an endless cycle of prayer and praise, hidden away from the rest of the world. It could be argued that it's a criminal waste of their talents and energy to spend all those years sending up one-way messages to their imaginary friend... And I'm very sure that an abbey like Brede would struggle, these days, to attract several new postulants a year, as they do in the book. And yet reading this lovely, passionate account of religious life, it's impossible not to be moved by the nuns' dedication, the rigour and the beauty of the life they've chosen. I can't help feeling that the wisdom and the peace that they earn, their work of prayer and music, does have value, even if it's difficult for a modern agnostic to understand. Even, perhaps, if there is no God. Mum, can I have some more onion rings? Mum, can you put this back in the fridge? Mum, I'm hungry. Can I have an icy pole? Can you help me pull it up? Mum, can I try that pure sugar thing [halva] again? Mum, can I have some more onion rings? Can I have my icy pole back then? Mum, can I have a jelly? Can you open it for me? Can you play - can you read to me outside? Can I have a chocolate digestive? Can I watch You Tube on the lappy? How do you spell You Tube? How do you spell Horrible Histories? Mummy, can you push me on the swing? Mum, Evie's not going away! Can you peel and cut up this apple for me? Can you tell Alice to stop watching the internet, cos it uses up too much bandwidth? Can I have some Stingose? Can I have some of that sugar stuff? Can I make the lasagne? Can I make it the way I want it, not how you want it? Can you pass me the fish oil tablets? Can I please have some lemon cordial? Can I have some more lasagne? Can I build a zoo? 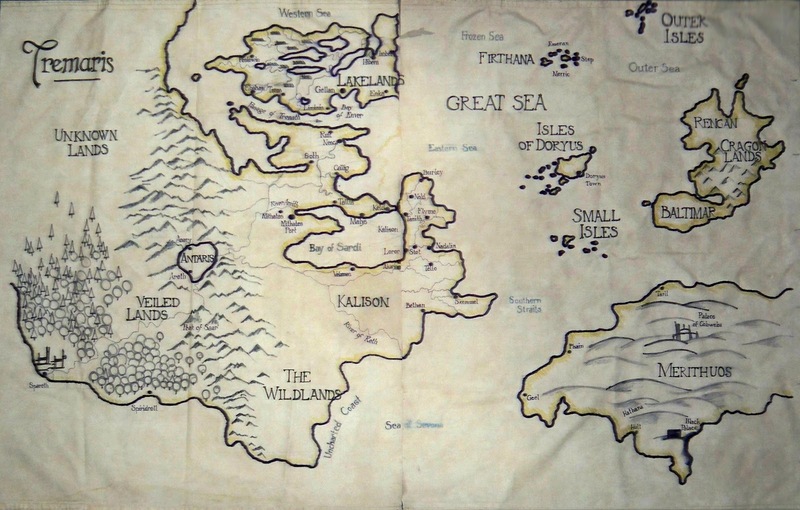 I'm writing to you today to tell you that I had always wanted to plot out a Map of Tremaris to hang on my wall, so finally after some time I decided to go on with the idea. My mother and brother helped me out so it ended up being a family activity we all really enjoyed. The image I'm attaching in this e-mail is the finished version. It's done on fabric and the actual size is about 100 cm x 160 cm. How cool is that? I wish I had one, too! I'm sure Beth Norling, who did the original artwork, would be proud. Alice is reading a book. I almost don't want to talk about it in case I put the mozz on it, but... She has been reading in bed every night for the last week or so, a chapter or two at a time. It's our old favourite, The 101 Dalmations, which I have read to the girls three or four times, so it is quite familiar. She says the words aren't jumping around as much as they used to; also that the old, yellowed paper makes reading easier, because the contrast between the white space and the print is less. Last night she had a choice between staying up to watch TV, and going to bed and reading, and she went to bed with her book. Of course, being Alice, she won't tolerate any hint of coercion. I can't tell her to go to bed and read; I can't talk about it to other people (so keep it under your hat, and please don't tell her I told you!) But at ten and a half, maybe we're turning a corner. Maybe. All I have ever wanted for Alice is that she might be able to partake in the enormous pleasure of curling up with a book, and it has broken my heart that she hasn't been able to do that. Cross fingers - it might be here at last. The sight of her sitting in bed, absorbed in her book, makes my heart flutter with joy. And now all I can think about is, what can I give her next? 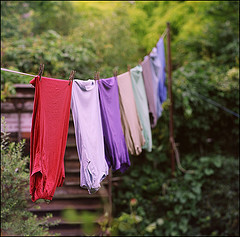 1) Hanging out the washing. 1) Shopping for Christmas presents. 5) Cleaning gobbets of hair and slime out of the bathroom basin. Your favourite, and least favourite, household tasks? Whole family sitting around this morning when they're supposed to be getting ready for work and school, watching 'Ra Ra Cleopatra' from Horrible Histories. We are all unwell to varying degrees, so the room resounds with coughs, sneezes and sniffles. Lovely. Alice: Henry and I are going to rob a bank. And it's okay, because Henry did some research and you can't go to jail until you're ten. Evie: I'm sad. Sad plus cross. And that makes GRUMPY. Alice rolls over and back again for the first time; very pleased with herself. Try to get her to stay up and watch educational TV about Henry VIII but she's poking her eyes out with tiredness. Nausea seems to be getting stronger. Threw up on Wednesday and almost did last night at the cooking smells. Bloody baby, you'd think it would want food! Finished 'Whole of the Moon' today. Severely depressed about it... Nothing happens, it's not even interestingly written. It just goes on and on in its tedious fashion, I felt like shouting WHO CARES??? when I was reading it through today. Vienna. C and I got U-bahn to meet Mum and Dad at Franz-Joseph station - late, because our map is totally stuffed... Walked for miles and finally got into our gallery (for free) - why? Because none of the bloody paintings we wanted to see were there! Cranky. C tried to post letters and had much trouble. Here, in my windy garret, my little flat, my wuthering heights whose windows won't stay open, my Alcatraz in the gum trees, here I can watch the sky. I never get tired of the sky. Landed at Gatwick at about 7.30am. Cold, damp, foggy, green. D & I took the bus to London. Lugged our stuff from Victoria coach station past a bomb scare, Buckingham Palace, down the Mall to Nelson's Column. A flock of pigeons flew directly at us, worse than the 'The Birds'! Tried to find Youth Hostel nearby but it didn't existed... Jet lag finally hit, too tired even for shower though disgustingly dirty and smelly. Still feeling miserable and funny. Did domestic things. Went to meet D at the supermarket but because the arrangement was so vague, he didn't come. Ironed B's shirts and felt motherly. C came over and cheered me up. 'Age' employment tomorrow. Lazy day. Had another driving lesson. Can do handbrake starts. Improving. Rang J. Bed at 1am. Mummy went to the dentist's. In the afternoon, K & E invited us over to swim in their pool. Mr V threw me in. K was mean to Hilly. I was dismayed to read in the paper on Saturday that the northern metropolitan region (our region) of the Education Department has decided that it can no longer "afford" to fund Reading Recovery tutors. Without these specialist tutors, the whole Reading Recovery program is in jeopardy. As far as I'm concerned, teaching children to read is the MAIN JOB of primary schools. Everything else is optional. And the kids who struggle need extra help, the kind of help they get from Reading Recovery. Alice benefited immensely from this extra attention. I only wish she could still get it, but even before these funding cuts, the program only helps kids up to Grade 2. If anything, they should be extending Reading Recovery, not cutting it back. If they don't get decent literacy skills in primary school, these kids are going to struggle to catch up. They will struggle for the rest of their lives. *And while you're at it, do the right thing by the nurses, too. Winter of Grace is something that I've searched for a long while: a realistic novel with a sense of the divine, of a layer deeper than this material world. That was something I'd expected to find only in either mediocre realistic fiction (from "Christian" publishers), or in genre fiction. Bridie's story feels true to my own life, as it acknowledges a desire for God and a search for belief without chaining it down to the censored words and content of so-called "Christian" publishing. It's real, but not the sort of reality that the mainstream problem novels show me: the bleak landscape of modern life, a world gone wrong with little to restore it. Winter of Grace is presented as a friendship story, as the tale of two girls whose friendship begins to fracture under adolescent searches for love and belief and values. And it is that, but it's also much more. This is a simple book that is not simple at all; that is honest about good and bad alike; that talks about searching but gives no easy answers. Winter of Grace is the lowest selling and least-reviewed of my books, but every review of it that I've come across has been so thoughtful and heartfelt that it makes me want to cry. A non-partisan book about a teenager's experience of religion was always going to be a tough sell, and I'm so grateful that the Girlfriend Fiction series provided me with a place to talk about spirituality and young adulthood in a way that wasn't going to scare the horses. Winter of Grace will be available in the US next year (I think!) as part of the repackaged series (Always Mackenzie is already out). It will be interesting to see if there's a stronger response to it in a more religiously-inclined country; though, as pointed out above, it's probably not what a 'Christian' market is looking for, either. It's never going to be a bestseller (to put it mildly) but I am very, very glad to have written it, and to know that it's finding readers who appreciate it. This might all sound crazy, but bear with me. For a few years now I've been a fan of Randy Ingermanson's snowflake method -- it's a good one to use when you have a mass of material swirling in your head and on the page, but the structure of your story is stubbornly refusing to emerge. A lot of meat, but no bones, if you will. I've now started playing with my own variation on this technique and so far it's proving quite useful. One big advantage (at least for me) is that at every stage, right up until the end, I can tell myself that I'm just playing, planning, roughing stuff out -- and by the time I get to the final stage, I can swing almost seamlessly into polishing, tweaking, editing and revising. 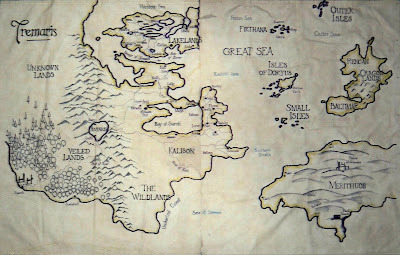 Because I really love the planning stage just before I start writing, and the revising stage, just after I finish writing, but the actual writing itself kind of freaks me out. An ancient stone circle and talking crows lead a lonely girl to old crimes, new friends and a sense of belonging. Which is 21 words, but hey, it doesn't have to be perfect. This is a great way of cutting to the very heart of what your story is about, a bit like a tag-line for the back cover. Basically from here, it's all about doubling, and doubling, and doubling. Sadie, newly arrived in town, finds a mysterious stone circle that enables her to understand the language of the crows. The crows take her back in time to witness a tragedy in which her family played a central role. Meanwhile, Sadie and her mother Ellie struggle to fit into the new town, where Ellie and her boyfriend have a difficult history of their own. Only by attempting to right the wrongs of the past can Sadie find a sense of belonging. Next I'll expand this paragraph into a longer summary of 250 words, fleshing out a bit more detail of the plot, but still keeping it to broad brushstrokes. And then I'll double that into a page-long summary of about 500 words. Now the secondary characters and subplots get a mention. Then I'll double that again into a more detailed 1000 word synopsis, and then again, into 2000 words. By the time I get to the 2000 word summary, I can break it up into 'chapter chunks' of about 100 words each, describing what will happen in each stage of the story. Now I can get a sense of what needs filling out, what incidents might not carry the weight of a chapter, and what elements might need to be broken up into smaller pieces. This outline is usually jotted down very roughly in point form -- because I'm only playing, right? Something like that - a kind of scene by scene breakdown. Now I can take each those rough chapter summaries and double them to 250 words or so, which might include snatches of dialogue, and a bit of shorthand description. And by the time I've done that, I've got a seven or eight thousand word thing which is looking pretty close to a very, very rough first draft. And all without actually writing anything!! My next step is to make a rough draft of each chapter -- say, 1000 words -- still not the real thing, still not actually writing -- and then expand each of those out again. And okay, I have to admit, that is pretty much a draft. But a rough one! A draft that will need tweaking, and polishing, and adjustment, and revision -- but that's not actual writing, is it? That's re-writing. A completely different, and much less arduous task, because most of the hard work is already done. See how brilliant this is?? And it's never too scary, because you're always building on something you've already done. All I need now is a snappy name. The Pizza Dough Method -- because it keeps doubling in size? The Lego Technique -- because it's about breaking everything down to basics, then building it up again? I'll work on it. Anything to avoid actual, you know, writing. * In case you hadn't realised, this is not from Crow Country! 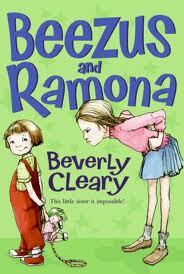 I picked up a few Ramona books years ago at the library sale but never thought of reading them to Evie until now. I missed out on them myself as a child so I didn't have that tide of nostalgia to sweep me along. But after we'd read all the Winnie-the-Pooh we had in the house, I needed something to fill the gap and spied these on the shelf. I was partway through the first chapter when I noticed that Alice had crept in to listen as well, and since then (we're now halfway through Ramona the Pest) I have been reading mostly to an audience of two. There aren't many books that can hold both Alice and Evie equally enthralled, so Beverly Cleary is clearly onto something special. I see there was a movie made last year. We won't be watching it. I would hate to spoil the lovely straightforward charm of the stories with dollops of contrived Hollywood saccharine, which I'm sure the film-makers couldn't resist. Anyway, long live Ramona! Meanwhile, I've also been reading A Stranger At Green Knowe to Alice. I dimly remembered reading this as a child and dismissing it as 'weird' and somehow not in keeping with the other Green Knowe books which I adored, so I'd never reread it. But this time around, it has kept us both absolutely spellbound. This is the book in which an escaped gorilla comes to Green Knowe (I know, it does sound bizarre). Ping, the refugee boy, manages to keep him hidden in the thicket for several days before Hanno's brief taste of freedom is inevitably, and tragically, cut short. I'd forgotten that Alice feels such a strong affinity with our primate cousins. She fell in love with Iwani, the baby siamang, whose upbringing was chronicled in The Zoo, and she is fascinated by all the apes and gibbons. The descriptions of Hanno, as a baby gorilla in the wild before his capture, mutely raging against his captivity in the zoo, and savouring his taste of liberty in Toseland Thicket, are powerful and moving. Hanno and Ping are both exiles, both displaced persons, and both find a refuge in the particular sheltered sanctuary of Green Knowe. There is no time-travel in this book, no ghostly encounters, but Ping and Hanno's doomed relationship has its own magic. Because we've read the book that follows this one, we knew what was going to happen. Alice made me stop reading a few pages before the end, 'so that in my mind, Hanno stays there forever.' She said, 'Stop now!' and slipped away. And I read the ending, and I cried. 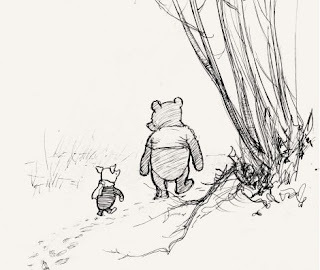 As a child, my own favourite character was Piglet, who is a Very Small Animal and not very brave. As I got older, I identified more with Eeyore's melancholic musings. But now I find myself becoming impatient with Eeyore's interminable gloomy self-absorption. I want to give him a shake, and tell him to get some exercise and some cognitive behavioural therapy! These days I find myself more drawn to busy, bossy Rabbit, always rushing about and trying to keep track of all his Friends and Relations. So much to do! Notices to write, instructions to give, Expoditions to plan, meetings to write up! But I hope I'm never too busy to sit in a quiet corner with Evie, and visit the Hundred Acre Wood. Today I took a bold step. I threw away my contact lenses. Since I changed to disposable lenses, I've been prone to saving them up for special occasions. Occasions deemed special enough to be 'contact-worthy' seem to have become rarer and rarer, to the point where I have pretty much stopped wearing them altogether, and finally I thought, what is the point of hanging onto them, while they gather dust in my bathroom? So I chucked them in the bin. I have written elsewhere about the way that glasses rendered me hideous, and contact lenses restored my self-confidence. But today, perhaps for the first time, I whole-heartedly embraced my identity as a glasses-wearing girl. Pretence is no longer possible. Though as Michael pointed out (after it was too late), what about swimming? Oh well, I'll just have to swim blind. And hope that other people will warn me about sharks. I asked if it would be okay to share this with you. I'm just so chuffed, because it's exactly the response I've been hoping for. Just wanted to let you know that I have just finished your book Crow Country and loved it. Being an Aboriginal woman who's family is the Gunai mob in gippsland. It was great to read how our culture and our stories can be preserved by an amazing writer such as yourself. To write in collaboration with our people surely this is how reconciliation should be portrayed. ... followed by a welcome to country by Aunty Di Murray. Jida gave us a wonderful performance, including some crow dance and 'waa' calls. ... then Paul Haw spoke about Footprints Across the Loddon Plains. And then we could all relax and enjoy the emu and crocodile sausages! When the first plane slammed into the World Trade Centre, I was asleep. Alice was only a few weeks old, and I was in the zombie-like, sleep-deprived state of most new parents. In my case, this was compounded by the fact that Alice and I took a long time to figure out how breast-feeding worked - so she was permanently hungry and cross, and I was permanently stressed and anxious. The only good rest I was guaranteed was the first, deep, dark sleep of early evening, after the nine o'clock feed. So when it all began, I was well and truly out of it. Michael came rushing into the bedroom to wake me. "Something's happening," he said. Something about a plane -- New York -- the Pentagon -- a skyscraper on fire. It seemed like a dream, I couldn't take it in. Drugged with exhaustion, I blinked at him blearily, rolled over and sank back into sleep. But when Alice woke for her two am feed, it was still going on. Chilled, I listened to the panic, the terror, the confusion, echoing from the radio. I still didn't understand, but I picked up my baby and held her, there in the darkness. I held her close, too numbed to cry. I had to leave the room last night, when the memorial shows came on TV. Just like ten years ago, I kissed my precious children, and I went to bed. But I did hear a little from the families of those who died that day. There didn't seem to be any hatred, or panic, or thirst for revenge -- just a terrible, aching sadness for those they lost, and a strong and steely love for those who remain. Perhaps that will be the ultimate legacy of 9/11. Perhaps one day, the memory of the politics and war-games and acts of violence in the name of God will fade away completely. And we'll be left with a reminder -- because we seem to need so many reminders -- that life is precious, and life is short, and not one of us knows when the end will come, hurtling from an empty sky.